Parents should avoid the old standby poison remedy of ipecac syrup and instead call poison control centers when children ingest toxic substances, the American Academy of Pediatrics says, reversing a long-standing position. For decades, doctors have recommended that parents keep a bottle of ipecac on hand to induce vomiting when children ingest something poisonous. The antidote, made from roots of the tropical ipecac plant, induces vomiting. Recommendations for using it have been based more on intuition rather on than any hard evidence that home use is effective, said Dr. Milton Tenenbein, director of the Manitoba, Canada, poison control center and lead author of the new guidelines. Earlier recommendations advised parents to call a doctor or poison control center before using the syrup, but Tenenbein said parents haven't always heeded that advice. "Unfortunately, the presence of ipecac in the home often results in its inappropriate use," says the new policy, which appears in December's issue of Pediatrics, being published Monday. Scientific advisers to the U.S. Food and Drug Administration recommended in June that the agency end over-the-counter sales of ipecac. An FDA decision is expected by early next year. Tenenbein said poison control centers have been phasing out use of ipecac for a number of reasons. It sometimes causes prolonged vomiting and lethargy similar to drowsiness that might be caused by an overdose of sedative pills. Those symptoms can complicate diagnosis and treatment, Tenenbein said. It also may not totally empty the stomach of poison, or may linger and cause a child to vomit up other antidotes, he said. Another study in the same issue found that home use did not reduce emergency room visits and did not improve outcomes. It is based on an analysis of data from the American Association of Poison Control Centers, which also is preparing new ipecac guidelines. Recommendations for using ipecac have been around since at least the 1960s, Tenenbein said. 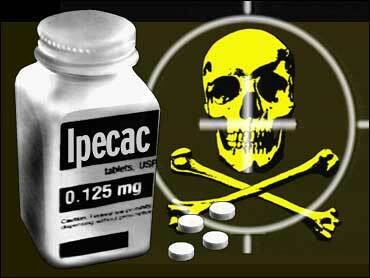 An American Academy of Pediatrics committee advised home use of ipecac in 1983.